Girolamo da Carpi (original name Girolamo Sellari) was an Italian painter of the Ferrarese school. According to Vasari he had apprenticeship under Garofalo whose style he did not adopt, however. He orientated towards Correggio, Parmigianino, Raphael, and in particular Dosso, to whom he was probably also an assistant. At Ferrara, after Dosso s outburst of Venetian and northern fantasy and Benvenuto da Garofalo s classicism, Carpi enriched the local tradition with echoes of Michelangelo. 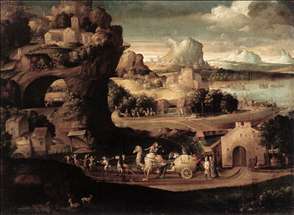 See more details about "Landscape with Magicians"